What to Know Before Buying a Portable Vacuum System | Atlantic Design, Inc.
Buying a portable vacuum is an expensive endeavor, but by becoming familiar with the design pros and cons of the main components, you can feel confident that you are spending your money efficiently. There are many design aspects of vacuums, including the collector air-to-cloth ratio, can velocity, filter interstitial air velocity, blower static pressure, among others. All the engineering details of these features cannot be covered here; however, if you know what general questions to ask, you should be on your way to making educated decisions that will ensure a successful and profitable job. The following questions are a great place to start and can be used as a guide. 1. WHAT SIZE VACUUM DO I NEED? The larger the vacuum, the higher the capacity and, consequently, the faster the operation. This is more critical when vacuuming longer distances: The longer the vacuum hose, the slower the abrasive recovery speed. For higher-mercury vacuums, a good general rule is to have approximately 2,500 cfm of air per 4-inch vacuum hose. You will need 5,000 cfm of air for two 4-inch vacuum hoses, 7,500 for three and so on. For optimum performance, choose the vacuum size for the volume and speed at which you want to vacuum. 2. WHICH PRESSURE VACUUM DO I NEED? Like size, the more pressure, the better. Vacuum pressure, like air pressure in air compressors, is typically measured in inches of mercury. Two inches of mercury equals, essentially, one psi. Vacuums typically come in two vacuum ranges: low mercury, or 15 inches, and high mercury, or 27 inches. The advantages of high mercury are significant, and a low-mercury vacuum should not be considered for portable vacuums unless that is absolutely all that is available. Low mercury can easily overheat and can require vacuum breakers that may open. This reduces air flow through the hose, which can cause it to clog. High-mercury blowers are more durable and are virtually impossible to overheat when installed in a properly designed vacuum system. While both kinds of vacuums will move abrasive and debris, the high-mercury system will not only be faster but more durable. Skid-mounted systems are best for job sites that require crane lifting. 3. WHICH ARRANGEMENT DO I NEED — TRAILER OR SKID? As with other types of equipment used in this industry, deciding between trailer or skid-mounted is directly related to the type of projects for which the vacuum will be used. For projects that have plenty of road access, a trailer is the best option. For jobsites where crane lifting is the primary means for moving the equipment, a skid is better. There are also trailer-mounted units with crane-lifting features, but this solution winds up being heavy and cumbersome to use and transport as either a trailer or skid. 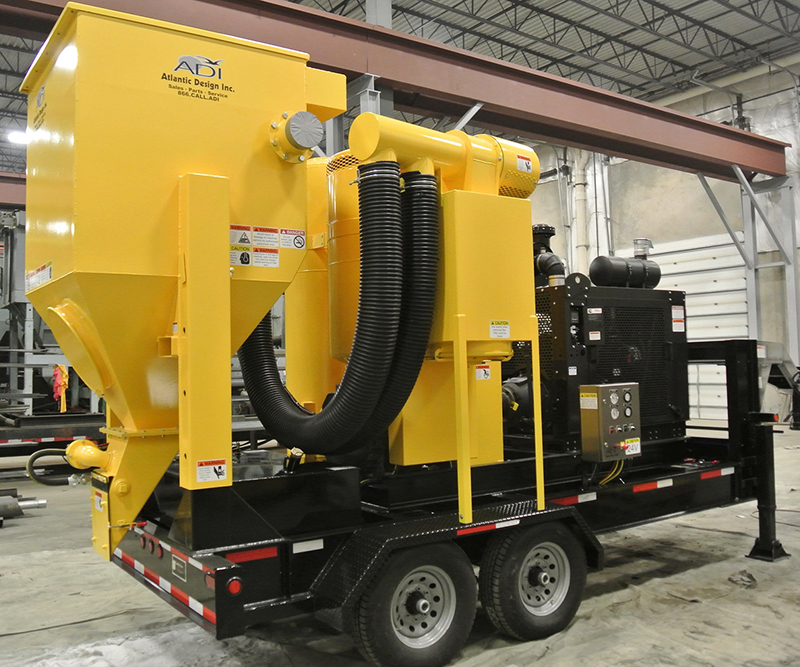 An alternative solution would be to purchase a skid-mounted vacuum that can be affixed on a trailer for transport. The towing height of the unit is another factor to consider, as it needs to be road legal — but shorter is always better. 4. WHICH COLLECTOR DESIGN SHAPE IS BEST FOR VACUUMING? 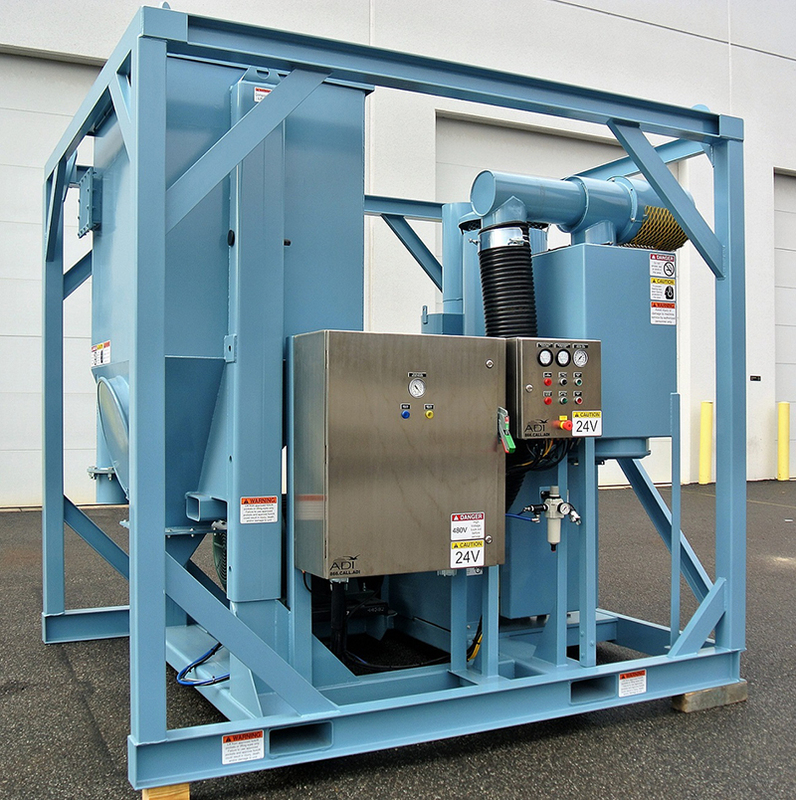 Any dust collector used on a vacuum system has to be designed to withstand the high-mercury vacuums generated by today’s high-powered vacuum equipment. Generally, the vacuum collector comes in a round or a rectangular/square design, and each has advantages. Round collectors are typically lighter and require less stiffening. Rectangular collectors require more stiffening but take up less space, allowing for a smaller, more compact vacuum system. Both designs have high, cyclonic inlets; however, the round style typically has a small inlet impact zone which creates holes in the housing or wear plates fairly rapidly. Rectangular collector housings have much larger impact zones and can more easily be reinforced with wear plates for a longer lifespan between repairs. Depending on use, many units run years without requiring repair or target plate replacement. Also, it’s important to consider how the filters are accessed when choosing a collector design. Most portable vacuums have top-load filters and require opening or removing the top door for filter access. Hinged doors are the safest and most convenient for this setup. These were pioneered on rectangular collectors and have been adopted by most round collector designs. Hose and piping size should increase as they get closer to the blower. 5. WHAT TYPE OF FILTERS ARE BEST? There are several types of filters available for portable vacuums. Cloth filter bags and pleated cartridges are the most popular. Both types are cylindrical with a hollow center and use a compressed-air pulse jet for cleaning. Dirty air passes through the filter media from the outside in. The filtered air then passes through the center into the collector housing, then through the blower, and is ultimately discharged into the atmosphere. Tubular filter bags, sometimes called socks, are constructed from several types of fabric that are installed by sliding over a ridged cage, allowing the air to pass through the cloth for filtration. The most durable of these is 16-ounce polyester felt, but by design, the bags do not have much filter area, requiring a larger filter housing to generate enough filter area. Pleated cartridges, however, offer much more filter area per filter, reducing the size of the collector housing needed. This is a great advantage in portable equipment. The best media for a pleated filter is spunbound polyester which has the same durability advantage as bags in a more compact design. Both types of filters will work as long as the filter housing is properly designed to accommodate the filter media being used. 6. WHAT IS THE PREFERRED AIR-TO-CLOTH RATIO? Filter air-to-cloth ratio is the relationship between the air flow to the amount of filter media. In Imperial measurements this is the amount of air in cubic feet per minute (cfm) divided by the area of the filter media in square feet. The lower the air-to-cloth ratio, the better. Typically, polyester filters bags can operate successfully at ratios of 6:1 and 7:1 for long filter life with an upper limit up to 10:1 in portable equipment. Pleated polyester cartridges typically operate at air-to-cloth ratios of 3:1 and 4:1 for long filter life with an upper limit of 6:1. Bag filters and pleated cartridges are both used in portable vacuums; however, pleated cartridges will provide better flow in a more compact design. 7. HOW SHOULD THE DUST DISCHARGE? How the dust is discharged from the collector dramatically affects the performance of the vacuum. Single dump, or flap valves, require stopping the vacuum recovery in order to dump the dust. This allows any material in the hose to drop out of the air stream. To get the material flowing again from the bottom of the hose takes a significant amount of time and effort. For example, 200 to 300 feet of hose can require 15 to 20 minutes to clear. Abrasive can be vacuumed during this time, but the hose will not be operating at full flow capacity. Alternately, using a double dump or double flap valve allows the dust and debris to be discharged continuously without any loss of air flow, keeping the vacuum material moving through the hose constantly. In other words, by simply putting on a double dump, vacuum capacity can be increased up to 25 percent. Double dump valves can increase vacuum capacity up to 25 percent. 8. VACUUM BREAKER OR SHUTOFF? A vacuum breaker simply breaks the vacuum power at the unit to release pressure from the hose; whereas a shutoff is an off/on valve similar to a blast deadman — either all or none of the air is going through the hose. Although both may work, there are instances where only the shutoff will reduce the flow enough to discharge all the material out of the collector. Eliminating all air flow allows the vacuum shutoff to function properly and is a much safer option, as even a small amount of air going through the system can create unsafe conditions by holding the dump flap valve closed. For example, material with a high concentration of very fine dust can be hard — and slow — to discharge from the collector. When a vacuum breaker allows a small amount of air flow to continue through the system, material is left in the collector. Very light material can also cause the same problem. Overall, a shutoff provides superior performance and safety. 9. WHAT SIZE INTERNAL AIR CONNECTIONS SHOULD BE USED? Perhaps the most overlooked part of a vacuum is the interconnecting pipe and hosing. Since vacuuming air is expanding all the way through the system, piping and hosing should get larger as they approach the blower. For example, if using a 4-inch hose to vacuum material, the hose should increase to a 6-inch diameter after 50 feet, as far as the collector inlet. Then the hose connecting the collector to the blower should be 8 inches. Choking the vacuum with a smaller connection size at the blower would slow the vacuum capacity. By using the proper hose sizes, vacuum performance will improve dramatically. Knowing which design choices most impact vacuum performance can help you purchase the best vacuum system for your needs. 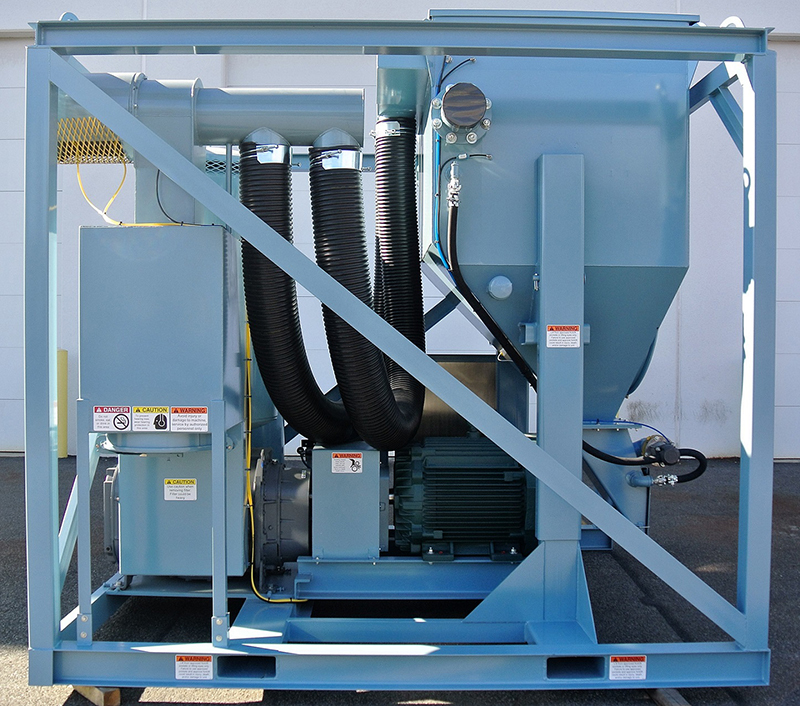 A well-designed portable vacuum system, when used correctly, can vacuum steel abrasive 2,000 feet or more. Getting the properly sized and functioning vacuum equipment will lead to less down time, more efficient production, improved safety, reduced job costs and, consequently, a better bottom line.